Thinkin' 'bout the times you drove in my car. Thinkin' that I might have drove you too far. And I'm thinkin' 'bout the love that you laid on my table. I told you not to wander 'round in the dark. I told you 'bout the swans, that they live in the park. Then I told you 'bout our kid, now he's married to Mabel. Yes, I told you that the light goes up and down. Yes, before they bring the curtain down. Talkin' 'bout a girl that looks quite like you. She didn't have the time to wait in the queue. She cried away her life since she fell off the cradle. "Badge" is a song performed by British rock music group Cream. It was written by Eric Clapton and George Harrison, and was included as a track on Cream's final album, Goodbye. "Badge" was a minor hit in the United States, peaking at number 60 on Billboard magazine's Hot 100 after its release as a single in April 1969. The single was much more successful in the United Kingdom, where it reached number 18. "Badge" was originally an untitled track. During the production transfer for the album Goodbye, the original music sheet was used to produce the liner notes and track listing. The only discernible word on the page was "bridge" (indicating the song's bridge section). Due to Harrison's handwriting, however, Clapton misread it as "badge" — and the song was titled soon thereafter. I helped Eric write "Badge" you know. Each of them had to come up with a song for that Goodbye Cream album and Eric didn't have his written. We were working across from each other and I was writing the lyrics down and we came to the middle part so I wrote 'Bridge.' Eric read it upside down and cracked up laughing – 'What's BADGE?' he said. After that, Ringo [Starr] walked in drunk and gave us that line about the swans living in the park. Common legends or misconceptions are that the name came about because its chord progressionwas B–A–D–G–E, (which it isn't,) or simply because the notation of a guitar's standard tuning (E–A–D–G–B–E) can be arranged to spell "Badge". In the US, Atco Records' initial releases of Goodbye and of "Badge" as a single gave the song's writing credit to Eric Clapton alone, with publishing credit to Robert Stigwood's company Casserole (BMI). Atco later corrected in 1969 with the release of Best of Cream, which lists both Clapton and George Harrison as the song's authors. 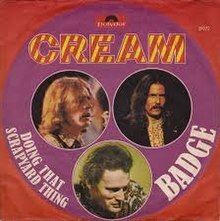 The UK single of "Badge" released by Polydor Recordsgave writing credit to both Clapton and Harrison, with publishing credit going to Dratleaf and Harrisongs Ltd. Since the early 1990s the writing credit has been listed as Clapton/Harrison with publishing credit going to E.C. Music, Ltd. and Harrisongs. Despite his alleged contribution to the song's lyrics, Ringo Starr is not credited as a co-author of "Badge". Jump up^ Castleman, Harry; Podrazik, Walter J. (1977). "1969 – "But If Paul's Alive, How Did He Die?"". All Together Now – The First Complete Beatles Discography 1961–1975 (Second ed.). New York: Ballantine Books. p. 73. ISBN 0-345-25680-8. Jump up^ "The Billboard Hot 100 - Chart Listing For The Week Of May 03 1969". Retrieved 18 January 2009. Jump up^ "everyHit.com - UK Top 40 Chart Archive, British Singles & Album Charts". everyhit.com. Retrieved 8 February 2015. Jump up^ Welsh, Chris. Cream: The Legendary Sixties Supergroup. Jump up^ "George Harrison performs on Badge by Cream". Beatles Bible. Jump up^ Cream: Selections From Cream - Those Were the Days. Hal Leonard. p. 2. ISBN 0-7935-9084-1. Jump up^ Kent, David (2005). Australian Chart Book 1940–1969. Australian Chart Book Limited. ISBN 0-646-44439-5. Jump up^ "Austriancharts.at – Cream – Badge" (in German). Ö3 Austria Top 40. Retrieved 19 September 2015. Jump up^ "RPM Search Engine" (PHP). Library and Archives Canada. 31 March 2004. Retrieved 19 September 2015. Jump up^ "Musicline.de – Cream Single-Chartverfolgung" (in German). Media Control Charts. PhonoNet GmbH. Retrieved 19 September 2015. Jump up^ "Cream – Badge | Top 40". Dutch Tip 40 (in Dutch). Stichting Nederlandse Top 40. Retrieved 19 September 2015. Jump up^ "everyHit.com - UK Top 40 Chart Archive, British Singles & Album Charts". everyhit.com. Retrieved 19 September 2015. Jump up^ Whitburn, Joel (2011). Joel Whitburn's Top Pop Singles. Menomonee Falls, WI: Record Research Inc. p. 209. ISBN 0-89820-188-8. Jump up^ Hoffmann, Frank (1983). The Cash Box Singles Charts, 1950–1981. Metuchen, NJ & London: The Scarecrow Press, Inc. p. 135. Ginger Baker - drums, percussion, vocals Jack Bruce - bass, piano, vocals, harmonica Eric Clapton - lead guitar, rhythm guitar, vocals "Strange Brew" (Eric Clapton/Gail Collins/Felix Pappalardi) - 00:00 "Sunshine of Your Love" (Pete Brown/Jack Bruce/Eric Clapton) - 02:47 "World of Pain" (Gail Collins/Felix Pappalardi) - 07:00 "Dance the Night Away" (Pete Brown/Jack Bruce) - 10:01 "Blue Condition" (Ginger Baker) - 13:44 "Tales of Brave Ulysses" (Eric Clapton/Martin Sharp) - 17:13 "Swlabr" (Pete Brown/Jack Bruce) - 20:02 "We're Going Wrong" (Jack Bruce) - 22:40 "Outside Woman Blues" (Arthur Reynolds arr. Eric Clapton) - 26:08 "Take It Back" (Pete Brown/Jack Bruce) - 28:38 "Mother's Lament" (trad. arr. Ginger Baker/Jack Bruce/Eric Clapton) - Disraeli Gears is the second album by the English rock band Cream. It was released in November 1967 and went on to reach number 5 on the UK Albums Chart. It was also their American breakthrough, becoming a massive seller there in 1968, reaching number 4 on the American charts. The album was #1 for two weeks on the Australian album chart and was listed as the #1 album of 1968 by Cash Box in the year-end album chart in the U.S. The album features the two singles "Strange Brew" and "Sunshine of Your Love". The title of the album is based on a malapropism. Eric Clapton had been thinking of buying a racing bicycle and was discussing it with Ginger Baker, when a roadie named Mick Turner commented, "it's got them Disraeli Gears", meaning to say "derailleur gears", but instead alluding to 19th-century British Prime Minister, Benjamin Disraeli. The band thought this was hilarious, and decided that it should be the title of their next album. The original 11-track album was remastered in 1998, and then subsequently released as a two-disc Deluxe Edition in 2004. In 1999, the album was inducted into the Grammy Hall of Fame. In 2003 the album was ranked number 114 on Rolling Stone magazine's list of the 500 Greatest Albums of All Time. VH1 also named it their 87th greatest album of all time in 2001. In 2008, the album won a Classic Rock Roll of Honours Award for Classic Album. The album was recorded at Atlantic Studios in New York during May 1967, following the band's nine shows as part of Murray the K's "Music in the 5th Dimension" concert series. Cream's American label, ATCO, was a wholly owned subsidiary of Atlantic Records. The sessions were produced by future Mountain bassist Felix Pappalardi -- who co-wrote the tracks "Strange Brew" and "World of Pain" with wife Gail Collins -- and were engineered by Tom Dowd -- who would later work with Clapton on projects such as Layla and Other Assorted Love Songs and 461 Ocean Boulevard. The owner of Atlantic Records, Ahmet Ertegun, was also present during the sessions. According to Dowd the recording sessions took only three and a half days, a feat considering the length of the album. The band's visas expired on the very last day of recording. Disraeli Gears [if you want an original mono version of this lp [or stereo come to that] make sure the record labels have the words for the credits "Apple" and "Windfall", or it's a reissue and not a genuine 1st issue]. "Strange Brew" / "Tales of Brave Ulysses"
"Sunshine of Your Love" / "SWLABR"
Disraeli Gears is the second studio album by the British rock band Cream. It was released in November 1967 and went on to reach No. 5 on the UK Albums Chart. It was also the group's American breakthrough, becoming a massive seller in 1968, and reaching No. 4 on the American charts. The album was No. 1 for two weeks on the Australian album chart and was listed as the No. 1 album of 1968 by Cash Box in the year-end album chart in the United States. The album features the two singles "Strange Brew" and "Sunshine of Your Love". The original 11-track album was remastered in 1998, and then subsequently released as a two-disc Deluxe Edition in 2004. In 1999, the album was inducted into the Grammy Hall of Fame. In 2003 the album was ranked No. 114 on Rolling Stone magazine's list of the 500 Greatest Albums of All Time. VH1 also named it their 87th greatest album of all time in 2001. In 2008, the album won a Classic Rock Roll of Honours Award for Classic Album. You know how the title came about – Disraeli Gears – yeah? We had this Austin Westminster, and Mick Turner was one of the roadies who'd been with me a long time, and he was driving along and Eric [Clapton] was talking about getting a racing bicycle. Mick, driving, went 'Oh yeah – Disraeli gears!' meaning derailleur gears...We all just fell over...We said that's got to be the album title. The album was recorded at Atlantic Studios in New York during May 1967, following the band's nine shows as part of Murray the K's "Music in the 5th Dimension" concert series. Cream's American label, ATCO, was a wholly owned subsidiary of Atlantic Records. The sessions were produced by future Mountain bassist Felix Pappalardi – who co-wrote the tracks "Strange Brew" and "World of Pain" with wife Gail Collins – and were engineered by Tom Dowd – who would later work with Clapton on projects such as Layla and Other Assorted Love Songsand 461 Ocean Boulevard. The owner of Atlantic Records, Ahmet Ertegun, was also present during the sessions. The original 11-track album was remastered by Joseph M. Palmaccio at PolyGram Studios for a 1998 release, including bonus photographs accompanying the original album artwork. The "Disraeli Gears Deluxe Edition" includes the complete album in both mono and stereo, demos, alternate takes and tracks taken from the band's live sessions on BBC radio. Included is an outtake of "Blue Condition" with Eric Clapton on lead vocals and demos of the songs "Weird of Hermiston" and "The Clearout" which were not released until Jack Bruce's first solo album "Songs for a Tailor". The cover art was created by Australian artist Martin Sharp who lived in the same building as Clapton, The Pheasantry in Chelsea. Sharp would go on to create the artwork to Cream's next album Wheels of Fire and co-wrote the songs "Tales of Brave Ulysses" and The Savage Seven movie theme "Anyone for Tennis" with Clapton. The photography was by Bob Whitaker, known for works by The Beatles including the controversial Yesterday and Today "butcher" cover. I got hold of a publicity shot and cut it up, along with cutouts from various books, laid the pieces out and stuck them together as a collage on a 12-inch square. I did some drawing outlines, and then painted all over it with fluorescent inks and paints of the time. I really wanted to capture that warm, electric sound of their music in the colours and expression of the cover. On my way to England, I'd gone [to Cambodia]. And in one of the towns I visited, there were these amazing sculptures with faces on each side, and huge trees growing out on top… Over the years, these great trees had taken root and grown. I suppose I thought that was a bit like the band: where you could see three faces, and the music coming out of their heads. The cover art was also used for the compilation Those Were the Days. "Disraeli Gears" features the group veering away, quite heavily, from their blues roots and indulging in more psychedelic sounds. The most blues-like tunes on the album are the remake of "Outside Woman Blues", the Bruce/Brown composition "Take it Back" which had been inspired by the contemporary media images of American students burning their draft cards which featured harmonica work by Jack Bruce, and the opening track "Strange Brew" which was based on a 12-bar blues song called "Lawdy Mama" and featured an Albert King guitar solo, copied note for note. 2. "Sunshine of Your Love"
4. "Dance the Night Away"
1. "Tales of Brave Ulysses"
^ Tracks previously released on the Those Were the Days box set. ^ Tracks previously released on the BBC Sessions compilation album. June 1967 "Strange Brew"/"Tales of Brave Ulysses"
October 1967 "Sunshine of Your Love"/"SWLABR"
Jump up^ Robert Christgau; David Fricke. "The 40 Essential Albums of 1967". Rolling Stone. Retrieved 13 November 2016. Jump up^ Stephen Thomas Erlewine. 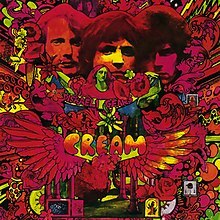 "Disraeli Gears – Cream (Review)". AllMusic. Rovi Corporation. Retrieved 7 November 2010. Jump up^ Graff, Gary; Durchholz, Daniel (eds) (1999). MusicHound Rock: The Essential Album Guide. Farmington Hills, MI: Visible Ink Press. p. 288. ISBN 1-57859-061-2. Jump up^ "Cream album guide". rollingstone.com. Retrieved 27 June 2017. Jump up^ "Review: Cream - Disraeli Gears - Sputnikmusic". www.sputnikmusic.com. Retrieved 27 June 2017. Jump up^ Larkin, Colin (30 September 2013). "The Virgin Encyclopedia of The Blues". Random House. Retrieved 27 June 2017 – via Google Books. ^ Jump up to:a b Disraeli Gears (CD liner). Cream. USA: Polydor Records. 1967. p. 2. 31453 1811-2. ^ Jump up to:a b "Cream – Billboard Albums". Allmusic. Rovi Corporation. Retrieved 7 November 2010. ^ Jump up to:a b Cash Box Top 100 Pop Albums of 1968. Jump up^ "The RS 500 Greatest Albums of All Time". Rolling Stone Magazine. 18 November 2003. Retrieved 19 March 2009. Jump up^ "Archived copy". Archived from the original on 12 December 2013. Retrieved 17 December 2013. Jump up^ "Disraeli Gears - a derailleur collection". www.disraeligears.co.uk. Retrieved 27 June 2017. Jump up^ "First US show for Cream and The Who that most fans don't know about." Songheads. 1 August 2009. Jump up^ "Eric Clapton Interview," on YouTube HOEPLA Television Show, VPRO Television, The Netherlands, 28 July 1967. Jump up^ "Archived copy". Archived from the original on 3 November 2014. Retrieved 15 September 2014. Jump up^ Platt, John (1998). Cream-Disraeli Gears : Classic Rock Albums. Schirmer Books. pp. 92–93. ISBN 0-8256-7176-0. Jump up^ Steffen Hung. "Cream – Disraeli Gears". norwegiancharts.com. Retrieved 8 August 2011. Jump up^ "Item Display – RPM – Library and Archives Canada". Collectionscanada.gc.ca. Retrieved 8 August 2011. Jump up^ Steffen Hung. "Cream – Disraeli Gears". greekcharts.com. Archived from the original on 17 March 2012. Retrieved 8 August 2011. Jump up^ "Australian Fun Countdowns: Accreditation Awards". Warner Music Sales International. BMI Music International. Retrieved 17 September2015. Jump up^ "British album certifications – Cream". British Phonographic Industry. Retrieved 17 September 2015. Enter Cream in the search field and then press Enter. Disraeli Gears. Those Were the Days. Disraeli Gears – Deluxe Edition JackBruce.com. Disraeli Gears – GB Signed Edition Gingerbaker.com.